If I need to spend the rest of my life looking like a furry red muppet monster, that's perfectly fine. Just as long as it gets me into the driver seat of a 911 GT3. 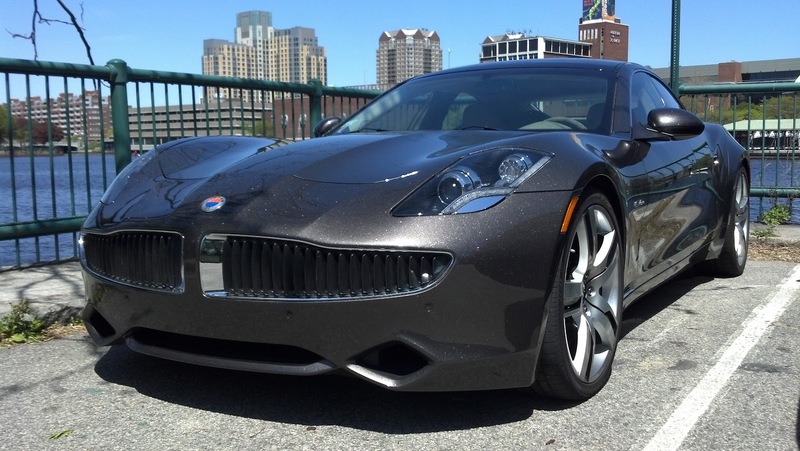 Hat Tip to Charles S.
You've seen the Fisker Karma pictures by now and undoubtedly know the basic facts: 204 HP, 960 lb/ft ot torque. OHL Fan #1: "OK.. I think it’s time for another Virtual Racing party.. Let’s do it before I have another kid.."
OHL Fan #2: "Is there something you need to let us know about here, or is this some form of abstinence? You do know there other methods? right?" OHL Fan #1: "Funny you mention it.. My wife came down to the garage at 1130 last night and woke me up.. I had fallen asleep in the M3 with my helmet on.. and harnessed strapped tight.. I remarked – The seat has such deep thigh bolsters that it feels like I’m being hugged like a baby.. if that isn’t a way to promote abstinence in the relationship.. I don’t know what is..I’ll find out in 2 weeks if there’s another kid on the way.."
OHL Fan #1: "Boy, wouldn’t it be something if this ended up on OneHotLap.com. Oops." OHL Fan #3: "Game on!" To which I responded: "That can be arranged. Send me a good picture (hint: I don't care where you find it)"
So what could go wrong with doing some donuts in a residential neighborhood? We're just having some fun, right? RIGHT? Love the "Is he all right?" comment toward the end of the video. Let's see, he just lost control of the pickup (they actually call these El Camino look-alikes "utes" in Australia), ran over the curb sideways, just missed a parked vehicle going backwards, dropped 3 feet and beached it on the other side of a brick fence in a residential neighborhood with a passenger in the car. Doing great, thanks! If you have you ever wondered what you and your car are really capable of, best way to find out is with an Autocross School. BMW CCA Boston of which I have been part of for the past 10 years just hosted its first 2012 autocross school. It was fantastic to see that of the 60 students who were lucky to get a spot in the first 9 hours of registration opening, 35 were first-timers! Staying up late or getting up early to sign up on time for the event paid off with 25-30 runs on 3 different courses. Tough to beat that value for the $85 it takes to run at the event, especially when you consider the quality of instructing: among the 20 instructors at the event (that's right! 3:1 student: instructor ratio), we had the 2011 SCCA Rookie of the Year Eric Heinrich and past Mazda Rev It Up Boston winner Steve Hazard. 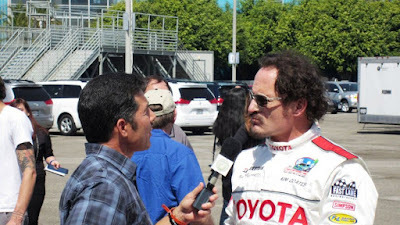 Congratulations to Adam Carolla for winning the 2012 Long Beach Pro/Celebrity Race! Congratulations to pro champion Frederic Aasbo for winning of the 2012 Long Beach Pro Race! The pros start the race 24 seconds after the celebs and they have to close a 2.4-second deficit per lap to catch up with the celebs over the 10-lap race. As usual, it's good to be a celebrity! 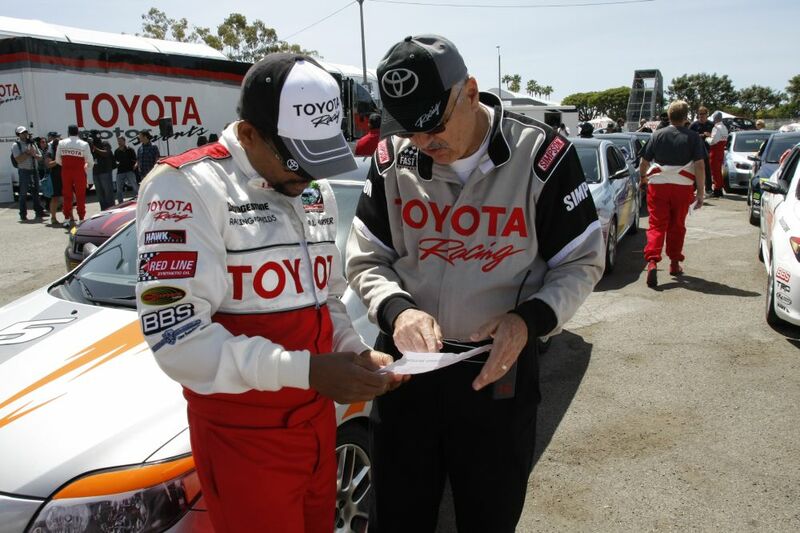 The participants in the Toyota Pro/Celebrity race are required to train for four days with Danny McKeever's FAST LANE race school to prepare for the event. Of the 4 days, 2 are mandatory on-track days spent together. The schedule allows plenty of time for publicity as well. TV personality Jillian Barberie Reynolds pictured on the right shows everyone how that's done. It’s a unique experience where professional athletes and actors, all successful in their own right, are put in a new humbling environment where they need to forget everything they know to be able to learn. Day 1 starts with a drivers meeting. As is typical for any driving school for newbies, there are many confused looks and blank stares. Much of the feedback starts making more sense only out on track. The celebs start with a very wide 400’ x 400’ skidpad and try to find the limits of the car on both dry and wet pavement. It's all about understanding weight transfer at this early stage in the training process. The skidpad exercise is very common at teen driving schools and other events designed to introduce performance driving. FAST LANE instructors slow everything down, so the drivers would understand better when the car loses traction and how to control it when that happens. Check out the pictures from Training Day for the 2012 Long Beach Pro/Celebrity Race. All photos are exclusively for OneHotLap courtesy of our friends at Danny McKeever's FAST LANE race school. Here is the final Part II of the 2012 Long Beach pro/celebrity race lineup. Check out who's who, the analysis of everyone's race strengths and weaknesses, and OneHotLap's race predictions. If you missed Part I, you can catch up with it here. Kim Coates, 53, Film and TV actor best known for his intense performances in Sons of Anarchy, Resident Evil: Afterlife, and Black Hawk Down. He will be seen on the big screen in the upcoming movies "Goon" and "The Truth." He has worked on Broadway portraying Stanley Kowalski in A Streetcar Named Desire and in the lead role of Macbeth performed at the Stratford Theatre. Unraveled focus and intensity. He's raced at Long Beach before. Ready to obliterate the field. OneHotLap's prediction: We are putting our money on Coates to win the Celebrity race. Today we are following up on our announcement that OneHotLap is joining forces with Danny McKeever's FAST LANE to bring you Part I of the 2012 Long Beach pro/celebrity race lineup. Check out who's who, the analysis of everyone's race strengths and weaknesses, and OneHotLap's race predictions. Can an Oscar winner, a UFC heavyweight champ, the most popular Mexican soap opera star, an "American Idol" mentor, and Kim Kardashian's stepbrother ever find anything in common? Apparently, they can and it will happen at the 36-th running of the Long Beach Pro/Celebrity Race. To bring you the best entertainment value out of the event, OneHotLap is joining forces with Danny McKeever's FAST LANE race school, which spends 4 days training each of the celebrities in racecraft to prep them for the event. McLaren, maker of the famed McLaren F1 supercar and owner of the McLaren Formula 1 team, has a new car available to order for U.S. delivery right now. True, its MP4-12C name sounds more like a new music player format but the spec sheet is really impressive: 592 hp and 443 lb/ft out of a twin turbo 4L V8! It's loaded with electronics and all reviews so far are indicating it's one of the easiest supercars to live with on the street. The MP4-12C's is very exclusive: its base price is $231,400 and there are only 9 U.S. dealerships you could buy it from. We visited The Collection in the Miami neighborhood of Coral Gables to find out more about it. Driving in an unfamiliar environment can be disconcerting. From navigating the neighborhood with too many kids on bikes to piloting through an insane traffic pattern, people tend to get flummoxed and do stupid things. These aren't particularly novel scenarios, we've all been there, but you don't want to honk at every kid on a bike thinking they're about to dart out and you don't want to float through traffic from lane to lane wondering where your exit is only to realize it's 5 miles away. What I'm trying to say is this: ultimately, your goal as a driver – or even as a human (I digress) -- is to avoid being "that guy". An admirable goal, indeed, and a one that should also carry over to your early days on track! So those of you who played hardball (rightfully so!) and abandoned our fan base, it's OK to come back out of the woodwork and talk about lap times. Let's go put some gas, rubber, and brake pads back to good use. And don't try to wipe that grin off your face. One Green Lap Reviews The Best Green Car Ever: A Porsche 911 GT3 RS!! Nothing screams "GREEN CAR!!" 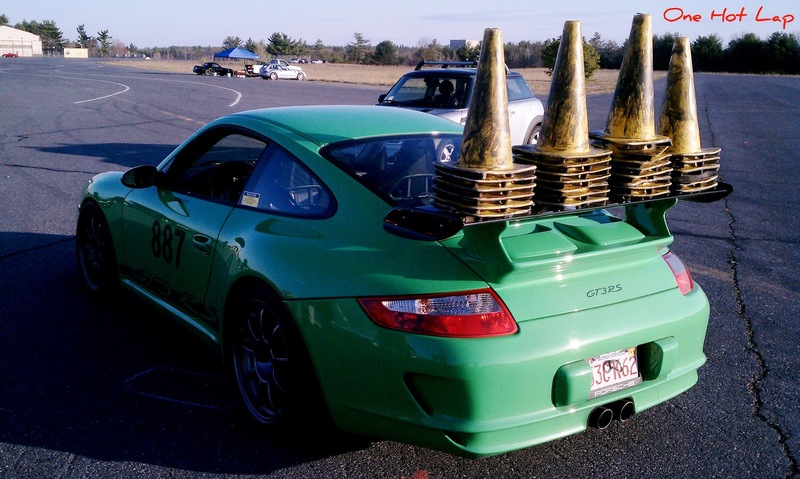 as much as a tree-frog-green Porsche 911 GT3 RS!! And I mean, the car literally screams! 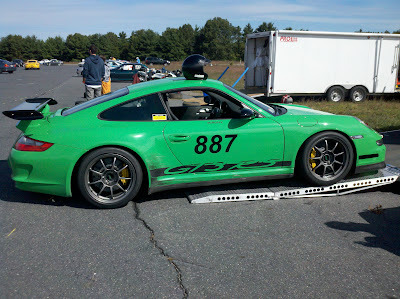 Here is a video of the GT3 RS at the Autocross. And that's barely waking up the beast at these low speeds. It's a 1974 Porsche 914, 1971cc, 4 cylinder. 94 HP at the crank. 0-60 in 10.5 seconds. 2,140 lbs with all fluids. Top speed is 115 mph. It was getting 27 mpg 40 years ago, which by today's standards is about 60 mpg! It deeply saddens me to share that OneHotLap will be closing down this Sunday. It has been an epic journey through performance driving but like all good things, it has eventually come to an end. I will forever cherish the great OneHotLap stories that have been shared on multiple occasions by the likes of Jalopnik, Auotblog, WorldCarFans and many other automotive sites. Sadly, we have come to the realization that with gas prices hovering over $4 for premium, as well as increasing environmental awareness, a green site would be better able to contribute to society's well-being!